My street, Aldama, never looks more festive than this time of year when long enramadas de papel picado—those colorful strings of perforated tissue paper—are strung up from the entrance of Parque Benito Juárez up to the Casa Rosada Hotel, marking the end of the street. 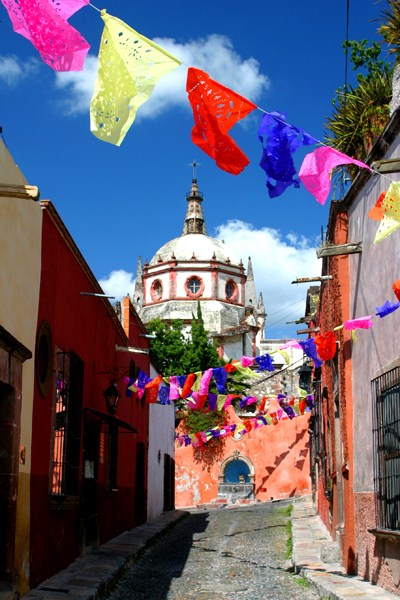 Many of the other streets in San Miguel are also decorated with bright green, yellow, pink, and blue papel picado. But not all of the streets. So who decides which streets get the festive-looking flags and who puts them up? I have no idea. It just seems like one morning you get up and walk out your door and there are strings and strings of flags gently waving in the breeze. The papel picados flap in the breeze along Aldama in San Miguel de Allende. Photo by David Lansing. I’ve heard a couple of stories as to how the perforated flags got started. Some say that the indigenous people, 500 years ago, made the flags from the bark of fig or mulberry trees for use in religious ceremonies. Others say that during the 16th century, Spanish galleons, laden with European goodies bound for the New World, used papel chino—Chinese tissue paper—wrapped around porcelain to protect it during the journey. But here’s my favorite story, partially because it cannot possibly be true but also because it comes closest to revealing Mexico’s unique symbolic relationship with all things metaphorical. They say there was a very wealthy man who owned a shop in Guadalajara that sold fine things and that he was always cheating his clients by giving them less than they had paid for. Everyone knew he cheated them and told him so but he just couldn’t seem to help it. It was like he was addicted to being a bad man. Eventually this way of living caught up to him and he was sentenced to prison. While he was in prison he thought about his life and vowed to become a better man. To remind himself of this vow, he started collecting scraps of paper and cutting them into various forms—a butterfly to remind him of freedom, the Virgin of Guadalupe to remind him of goodness, an ox to remind him of strength, and so on. When he completed one papel picado, he would string it next to the one before it. And so it went until he had a curtain of flags representing the discarding of his old life and the beginning of his new life. When he was finally freed from prison, he burst through this curtain and announced to his friends that he was a new man. And every year after that, on the anniversary of his release, he would design a curtain of papel picados and throw a big party for everyone he had ever cheated as a way to make amends. And others soon followed this tradition. And that’s why there are enramadas de papel picado decorating Aldana street today. Or so I like to think. 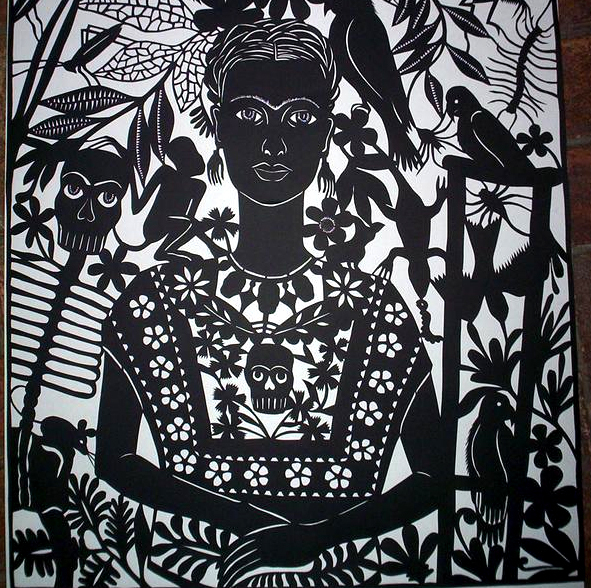 A papel picado masterpiece of Frida Kahlo by Margarita Fick. Of course, the papel picados decorating my street are just cheaply manufactured strings of plastic. But there are still some people who make their own from tissue paper. And the tradition is that when the Day of the Dead ends, the papel picados are left to fly in the open air until the rain reduces them to nothing. I like this image. One of the masters of papel picados in San Miguel is Margarita Fick. What she is able to do with tissue paper is absolutely art. Just take a look at this papel picado she made of Frida Kahlo and some of her other works, which are collected by many, at her website, www.myspace.com/margaritafick. Wonderful website…She does amazing work…Love all the detail…I am definately going to San Miguel….Loving the whole visit there….